Linguistics for Business: Capturing, Analyzing and Understanding Language–use in the Workplace – both a linguistics course and a business course. Six 2–hour classes and one 3–hour class, each covering a different topic relating both to business and linguistics. Seven evening sessions – Thursdays at 6 pm –– from June 6 to August 29, 2019 – Edgewood College. 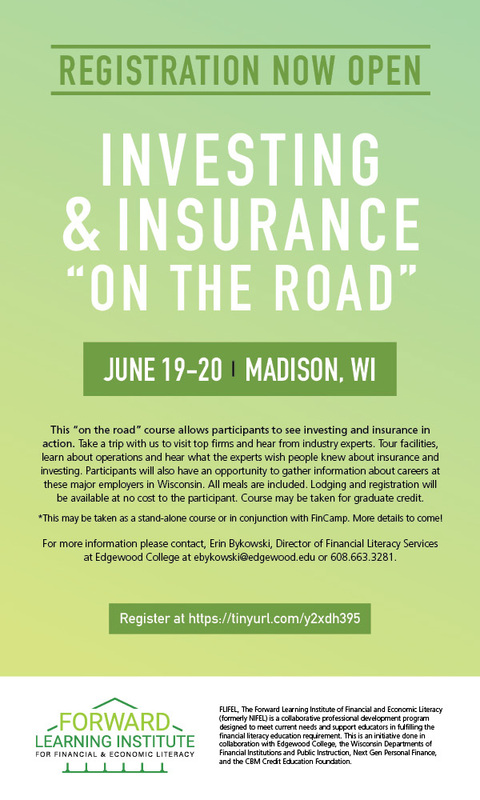 Investing & Insurance “On the Road” – this course allows educators to see investing and insurance in action, and hear what experts wish people knew about insurance and investing. Wed. June 19, 12:00-5:00 pm; and Thurs. June 20, 8:00 am – 5:00 pm – Madison, WI – course, lodging & meals all for only a $20 deposit. Edgewood College values the needs of educators, business professionals, and community members in their quests to pursue professional development and continuing education. School districts and other educational entities, businesses, and non-profit organizations have partnerships with Edgewood College to provide professional and continuing education opportunities for adult students. instructors interested in working with Edgewood College on credit or non-credit courses. Students can access available courses at Edgewood College’s Quick Enroll site; there are links to it on every page here. Instructors can access course information by clicking on the Quick Enroll box above.